Worship and praise are an important part of the Sunday morning church service. Powerful worship sets the stage for powerful preaching. Worship opens up our hearts as we enter into His gates with gladness and into His courts with praise. True worship involves reverential human acts of submission and homage before the divine Sovereign in response to His gracious revelation of Himself and in accord with His Word. Therefore, we believe our purpose is to prepare ourselves and the congregation to worship in Spirit and in truth (John 4:24) through the singing of theologically rich songs, expositional preaching, and humble obedience. The worship at Lake Country Bible Church is a blend of traditional hymns and contemporary praise songs. 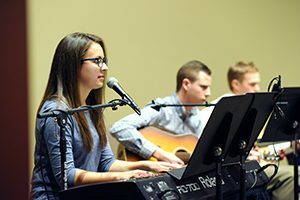 Our worship teams consists of singers and musicians that beautifully lead the worship so that all who attend church can focus on worshipping the Lord in spirit and truth.